In our previous installment, we took a look at some of the best performance practices in Hibernate 5 and Spring Boot 2. We are going to take a look at remaining tips and tricks you should be using in your projects. Let's get to it! "Item: 26: How To Extract DTOs Via SqlResultSetMapping & NamedNativeQuery"
"Item 27: How To Extract DTOs Via javax.persistence.Tuple And Native SQL"
"Item 28: How To Extract DTOs Via javax.persistence.Tuple And JPQL"
"Item 29: How To Extract DTOs Via Constructor Expression And JPQL"
"Item 30 How To Extract DTOs Via ResultTransformer And Native SQL"
"Item 31: How To Extract DTOs Via ResultTransformer And JPQL"
Description: Fetching more data than needed is prone to performance penalties. Using DTOs allows us to extract only the needed data. In this application, we rely on Blaze-Persistence entity views. Call a method of this repository, such asfindAll(),findOne() , etc. Inserts and deletes that affects @ElementCollection without @OrderColumn are prone to performance penalties. With@OrderColumn, the things are getting a little bit better. Description: This application reveals the possible performance penalties of using @ElementCollection— in this case, without @OrderColumn. As you can see in the next issue (item 34), adding@OrderColumn can mitigate some performance penalties. Inserts and deletes that affect@ElementCollectionwith@OrderColumnare prone to performance penalties. But, it is better than using it without @OrderColumn. Description: This application reveals the possible performance penalties of using @ElementCollection. In this case, with@OrderColumn. But, as you can see in this application, by adding@OrderColumncan mitigate some performance penalties when operations take place near the collection tail (e.g., add/remove at/from the end of the collection). Mainly, all elements situated before the adding/removing entry are left untouched, so the performance penalty can be ignored if we affect rows close to the collection tail. Open-Session In View will fetch the lazy entities (if any) even if you don't use them further, and this can lead to a serious performance penalty. Description: TheOpen-Session in View anti-pattern is activated by default in Spring Boot. If you prefer to use it, then it is a good approach to try to mitigate its performance penalties as much as possible. One optimization consists in marking theConnectionas read-only, which would allow the database server to avoid writing to the transaction log. Another optimization consists in explicitly setting the lazy properties of the fetched entities when you don't want them to be lazily initialized.
" NOTE: This filter will by default not flush the Hibernate Session, with the flush mode set to FlushMode.NEVER. It assumes to be used in combination with service layer transactions that care for the flushing: The active transaction manager will temporarily change the flush mode to FlushMode.AUTO during a read-write transaction, with the flush mode, reset to FlushMode.NEVER at the end of each transaction. If you intend to use this filter without transactions, consider changing the default flush mode (through the "flushMode" property)." SQL JOINS and DTOs are our allies in the fight against N+1 issues. Items 36-42 contain a bunch of examples. Description: This application is a proof of concept for using Spring Projections (DTOs) and inner joins written via JPQL and native SQL (for MySQL). - Query all tournaments that have players with rank smaller or equal to "rank"
"Item 37: How To Use Spring Projections(DTOs) And Left Joins"
"Item 38: How To Use Spring Projections(DTOs) And Right Joins"
"Item 39: How To Use Spring Projections(DTOs) And Full Joins"
"Item 40: How To Use Spring Projections(DTOs) And Left Excluding Joins"
"Item 41: How To Use Spring Projections(DTOs) And Right Excluding Joins"
"Item 42: How To Use Spring Projections(DTOs) And Outer Excluding Joins"
Typically, the performance issue described in this section is observed directly in production, since it involves heavy loading. Mainly, Spring post-commits hooks hold the database connection open until they finish. Adding time-consuming tasks in a post-commit hook will keep the connection open after commit, and under a heavy load, will lead to connection pool starvation. Apparently, you may think that the connection acquisition takes a lot of time. Description: This application is a proof of concept for using Spring post-commit hooks. Avoid time-consuming tasks in post-commits since the database connection will remain open until this code finishes. Hibernate 5.1 introduced explicit joins on unrelated entities. 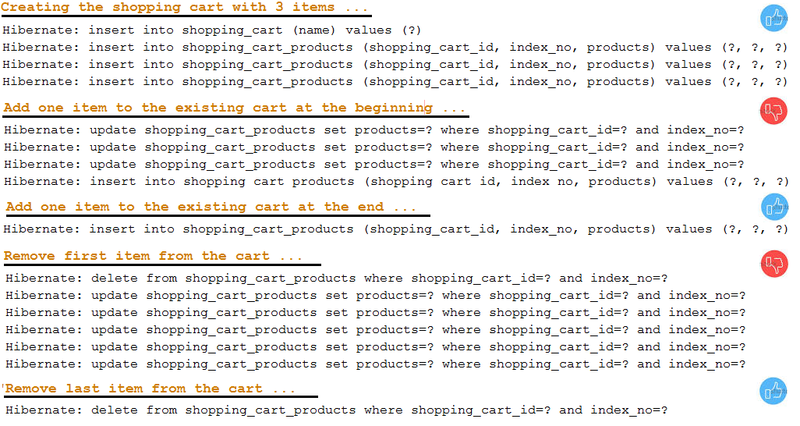 The syntax and behavior are similar to SQL JOIN statements. Description: This application is a proof of concept for using Spring Projections (DTOs) and join unrelated entities. Hibernate 5.1 introduced explicit joins on unrelated entities and the syntax and behavior are similar to SQL JOIN statements. Lombok is a very popular and useful library these days. Nevertheless, pay attention that Lombok@EqualsAndHashCodeon entities can cause serious issues. 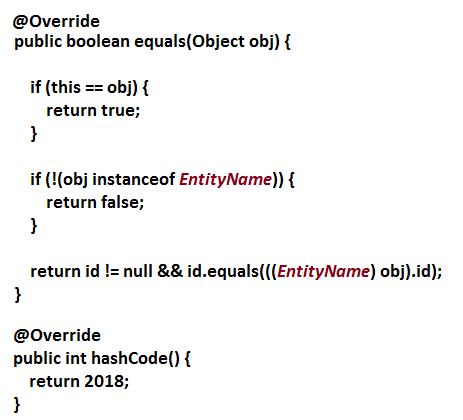 Description: Entities should implementequals()andhashCode()as shown here. The main idea is that Hibernate requires that an entity is equal to itself across all its state transitions (transient, attached, detached, and removed). Using Lombok@EqualsAndHashCodewill not respect this requirement. If you never got the famousLazyInitializationException, then you never used Hibernate :) But if you got it and you fixed it by switching fromLAZYtoEAGER, then this item is for you. Description: Typically, when we get aLazyInitializationException, we tend to modify the relationship fetching type fromLAZYtoEAGER. That is bad! This is a code smell. The best way to avoid this exception is to rely onJOIN FETCH + DTOs (if needed). This application is aJOIN FETCHexample with no DTOs (it fetches entities in a singleSELECTquery). But, based on the DTOs examples from above, you can easily adapt it to use DTOs as well. Merging collection correctly is not an easy job! Description: This is a Spring Boot example based on the following article. This is a functional-style implementation of Vlad's example. It is highly recommended that you read this article. Acquiring a database connection and not use it immediately can lead to performance penalties. Mainly, holding a connection without interacting with the database is a bad idea, since somebody else may need a connection and is waiting for one to be available. Description: This is a Spring Boot example that exploits the Hibernate 5.2.10 capability of delaying the connection acquisition as needed. Normally, a database connection is acquired immediately after calling a method annotated with @Transactional. If this method contains some time-consuming tasks before the first SQL statement, then the connection is held for nothing. But, Hibernate 5.2.10 allows us to delay the connection acquisition as needed. This example relies on HikariCP as the default connection pool for Spring Boot. Typically, we don't care too much of how the Primary Keys are generated or obtained. Or, if we care, then we decide to go with theSEQUENCEgenerator as a very convenient, flexible, and efficient approach. Nevertheless, each sequence value requires a database round trip, and this cannot be good for performance. Thehi/loalgorithm is an optimization algorithm for generating sequences of identifiers. Description: This is a Spring Boot example of using thehi/loalgorithm for fetching 1000 PKs in 10 database roundtrips for batching 1000 inserts in batches of 10 inserts. 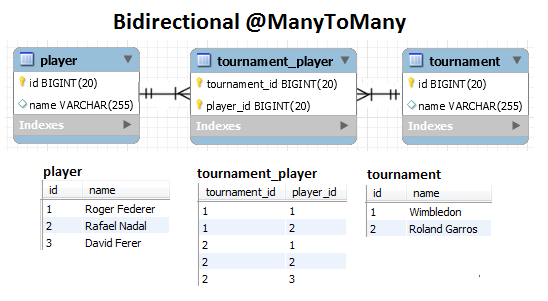 Do you need a many-to-many table relationship and you don't want to map it via two bidirectional@OneToManyassociations? You prefer to stick with a bidirectional@ManyToMany? OK, then do it as efficient as possible. Description: This is a Spring Boot proof of concept for writing an efficient bidirectional@ManyToMany association. UsingListinstead ofSetin@ManyToManymay lead to more SQLs than expected (e.g., for remove operations) and, therefore, to less performance. Description: This is a Spring Boot example of removing rows in case of a bidirectional@ManyToManyusing aListand aSet. The conclusion is thatSetis much better! This applies to unidirectional as well!